A Hampshire vineyard is expanding its facilities with a steel-framed wine cellar and visitor centre. If one was listing famous winemaking regions of Europe, you would perhaps mention Champagne, Burgundy, Bordeaux or Tuscany, but the South East of England would probably not be one of your initial geographical choices. However, this perception could be an error, as English wines, and in particular the sparkling variety, have in recent years secured growing worldwide recognition by winning some of the most prestigious awards and trophies in international competitions. According to the latest data from Wine GB, the amount of vineyard acreage in the UK has grown by 150% in the last 10 years and tripled since the turn of the century. Approximately 75% of this total (4,749 acres) is in the South East and the sparkling varieties of grape, Pinot Noir, Chardonnay and Pinot Meunier account for 71% of all grapevines planted. “The chalky sub-strata of the South Downs are identical to that of the Champagne region of northern France and so this part of England has the right conditions and climate to produce some the best multi-vintage sparkling wines,” says Phillip Kellett of Hambledon Vineyard. Located in the heart of Hampshire and in the village credited with being the cradle of modern cricket, the Hambledon Vineyard is said to be England’s oldest commercial vineyard having been established in 1952. Phillip’s brother Ian bought the vineyard in 1999 and has since expanded the operation so that today it comprises over 200 acres. This is spread over a number of local sites with each one planted with the three grape varieties most commonly used in the production of sparkling wine. In 2018, the vineyard produced 300,000 bottles of English sparkling wine. The two-storey building has been dug into a chalk hillside and consists of a lower level cellar and an upper floor that will house the visitor facilities and further wine storage space at the rear of the structure. 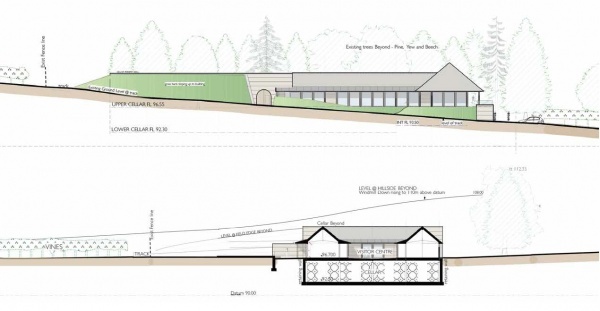 As the hillside topography slopes downwards from the back of the building, the cellar parts of the structure will be below ground, as the roof at the rear is at ground level. The front of the building meanwhile, protrudes out of the hill. Partially burying the structure into the hill has two advantages, firstly the wine bottles will be housed in a cool, humid subterranean basement, which is ideal, and secondly the building will be unobtrusive by blending into the landscape. According to Phillip Kellett, other reasons for choosing a steel-framed solution were cost and the strength of steel. On the upper floor, the bottles and their stillages will be exerting up to 100t per m2 of loading onto the supporting beams. The beams forming the first floor are a mixture of 254UC and 305UC sections, along with 457UBs. The steel frame is founded on a concrete raft foundation which was cast directly on top of the chalk rock. The raft was installed once the large excavation process, was completed. The dig saw 10,000m3 of chalk excavated and the majority of this overburden will be used as backfill once the building has been finished. The steelwork is based around a fairly regular column grid pattern; most bays measure 6m-wide and the steel structure for the first level is 10 bays long × four wide. Stability is derived from cross bracing, positioned in bays along both main elevations. 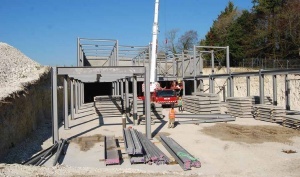 Steel beams support precast flooring planks with the aid of secondary beams placed at half points within each bay. Steelwork contractor Builders Beams installed these planks as well as precast wall units as part of its main steel erection programme. The steel frame also incorporates an upper level cellar erected on the same grid pattern as below, but with a slightly lower floor-to-ceiling height of 4.5m, compared to 4.7m. 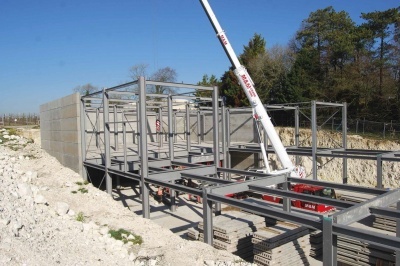 The upper level steelwork only occupies the rear five bays, as the front portion of this floor will comprise a timber-framed visitor centre that will be supported on steelwork. Not all of the steel frame accommodates wine storage as two rows of bays on the lower floor will house the building’s main entrance, a wine tasting room, reception, meeting rooms, toilets and stairs. Meanwhile, the upper level’s timber visitor areas will be housed around an internal courtyard and will include a tea room, function and wine tasting room, a shop and offices. The Hambledon Vineyard cellar and visitor centre is expected to be complete by early 2020.